For years, Bowflex has been manufacturing high quality and reliable exercise-related products. 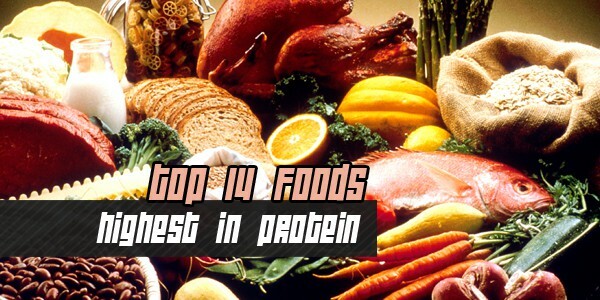 Primarily, the company specializes in producing at home weight systems and adjustable dumbbells. Often, people fail to meet their exercise and weight loss goals because the lack the necessary equipment at home or the funds to join an expensive gym. However, with the BowFlex SelectTech 552 Adjustable Dumbbells, people can workout from the comfort of their home with an exercise apparatus that allows for hundreds of different weight training activities. 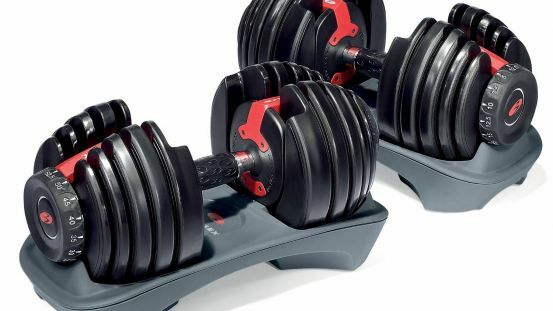 In this article we will review bowflex selecttech 552 adjustable dumbbells, continue reading to find out the truth about the product. Not only is a membership at a gym expensive, but also it can be a depressing experience for people lacking in self-confidence. When you’re overweight or conscious about the way you look, working out in a public setting can often be demoralizing and embarrassing. 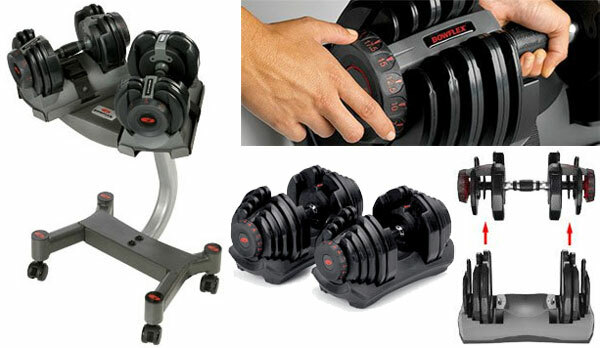 However, with the BowFlex at home weight training dumbbells one can workout without having to worry about prying eyes. Working out form the comfort of your home does not mean that you have to spend thousands of dollars on unnecessary and space consuming equipment. Luckily, the BowFlex SelectTech 552 adjustable dumbbells are designed for space efficient at home training. The sleek and novel design, ranges in weight from 5 pounds to 52.5 pounds. The product utilizes 15 weight sets in one small package that can be changed with the turn of a hand. Each weight set is a different weight increment allowing users to build up to a higher weight overtime. The dumbbell includes a 2-year manufacturer’s warranty that covers the weight plates and all the components of the product. Among the thirty different exercises that can be done on the device are squats, lunges, dead lifts, abdominal lifts, chest presses and more. While the Bowflex SelectTech has many positive characteristics its most important features is the ability to adjust the weight output in just seconds. When the device is set up, the dumbbell sits in a semi-enclosed case that has slots for each different weight amount. That way, when you change the weight of the device you don’t have to pick up a bulky or cumbersome dumbbell. To adjust the weight of the dumbbell all the user has to do is place it in the stand and rotate the handle on each side of the dumbbell. Once a new weight is selected, the device will automatically lock on to the new weight and lock it to the dumbbell. Since the amount you are able to lift for each exercise may vary, having the ability to easily adjust the weight without having to use many different dumbbells is an excellent feature. Furthermore, the Bowflex Select Tech 552 is not bulky or large and can easily fit in any size closet or bedroom. The industrial and modern looking device is sure to appeal to any user and will not look out of place in your home. Choosing a downside for this device is a challenge, as there are very few problems associated with the Bowflex Select Tech 552. However, compared to many other adjustable dumbbells that offer more weight options, the BowFlex may be considered costly. However, with its user-friendly design and proven durability, the BowFlex SelectTech is well worth the extra cost. 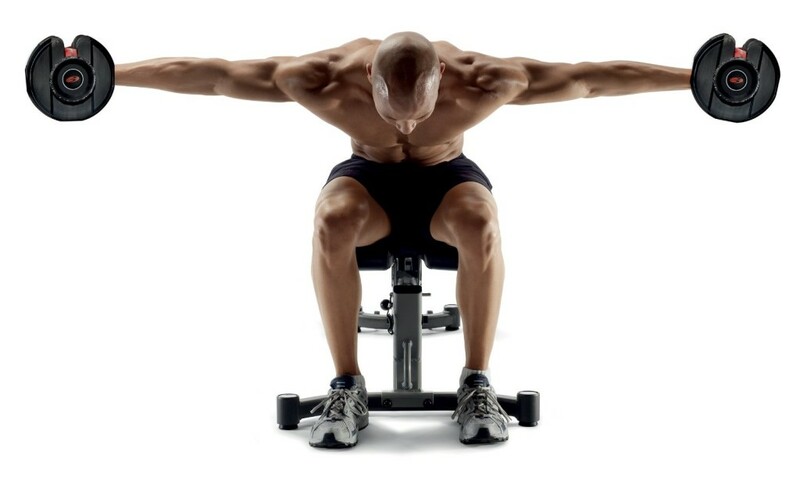 Additionally, some consumers felt that the length of the dumbbell made it cumbersome to lift. However, overtime users will become used to the size and adjust their workouts accordingly. Currently, the BowFlex SelectTech 552 is one of the most popular dumbbell sets for sale on Amazon and other similar websites. Users are raving about its functional design, durability and aesthetically appealing construction. These dumbbells are an excellent option for both new and experienced weightlifters alike.